Four policeman on motorcycles zoomed past my taxi, just barely squeezing in front of us. We slowed down as we noticed the large crowd and several more police officers gathered around a pharmacy a block from my dentist. My taxi driver speculated that someone must have tried to rob the pharmacy. I told my taxi driver that this is why I don’t drive to the dentist! He went around the block and slowly inched up to the barricade blocking off the street to the orthodontist/dentist’s office. The guard asked my driver where we were heading and the guard let us through. I guess the guard believed him, because without some planning you would not know that a dental office was in this cul de sac, a block from the main road. 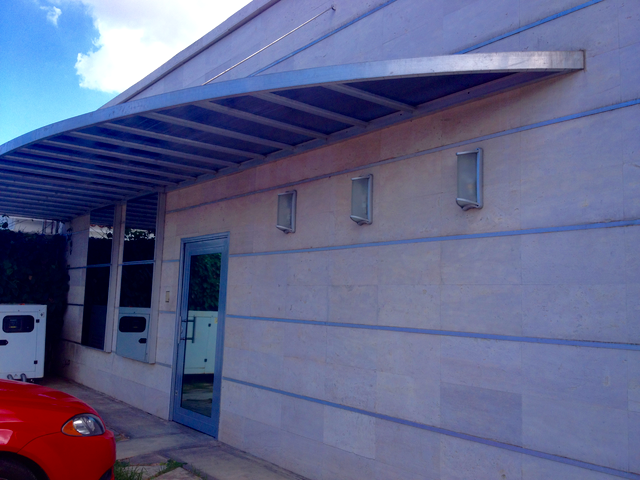 My nondescript dentist/orthodontist office- notice the lack of any kind of sign (and the mirror doors and windows)! Last week I think I wrote about how I broke my tooth while eating popcorn (I can’t remember because I’ve been crazy with report cards!). After the dentist fixed my broken molar they took a mould of my mouth for a new retainer. I got my braces off when I was 14 or something so mine was about 15 years old- gross! Today I went to the orthodontist/dentist and when I asked them if it is normal to feel pain when I chew with the new tooth she did a quick test and sanded it down a tiny bit. Hopefully it helps. Then she got to work with my new retainer. 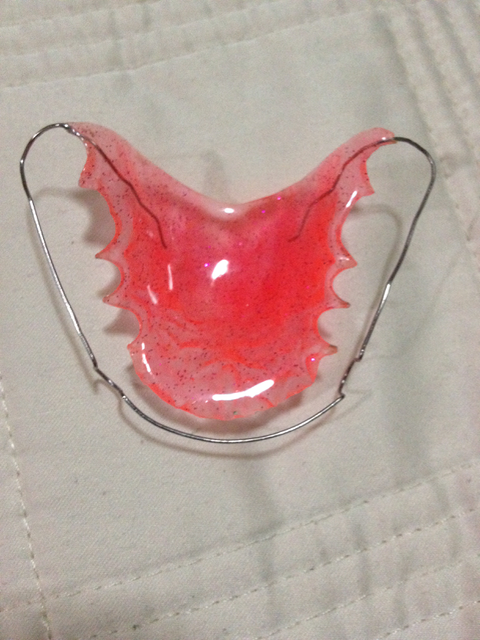 A couple of weeks ago when I was there last I had brought my old retainer along in case they needed to see what I was currently using. I didn’t know it, but the orthodontist had taken a look at it while they were working on my molar! She fit the new retainer to my mouth, explained (in ENGLISH) how to take it in and out properly) and then let me check it out in the mirror. I couldn’t have been happier. Then she installed a permanent wire retainer thing against my lower teeth. Apparently this is a thing now? It is not visible while smiling and seems very unobtrusive. Much better than needing a second retainer. When I inquired about being able to floss she gave me some inter-dental toothbrushes and said that I should come in for yearly cleanings as usual and be sure to brush well. All of this to say that I felt like I was treated like a VIP by kind and helpful staff who spoke decent English and spoke Spanish slowly when necessary. I was completely happy to pay less than $55 USD for the mould, installation of the lower retainer wire, and fitting of the upper retainer! In the US a retainer can be $500-$1000. With that kind of savings I can really see why people from the US come to Venezuela regularly to go to their dental office! Not to mention that every time I went to the dentist in the US I always had to wait at least thirty minutes, fill out paperwork, wait some more, and THEN get charged a $20 co-payment when I had insurance. I will be returning to my dentist in Venezuela for sure! Have you ever had dental work done in a foreign country? Was it cheaper than the US? Was the experience better than the US? wow you´re really lucky to have found a dental clinic where you dont have to wait at all. The orthodontist I go to who happens to be very reputable in Valencia has a very busy practice, it´s not unusual for me to wait two hours when I go every month to have my braces adjusted. Regarding costs yeap youre right, most medical services are dirty cheap here when compared to those in The States. Wow! I hate to wait and it would really frusterate me to have to wait that long for an appointment. You must have remarkable patience! Tell me about it, I cant wait to have my braces removed !!! Sorry. I’m no longer in Venezuela so I can’t look it up. I just remember that it is in a dead end street really close to Embassy Suites in Valencia. Sorry. I’ve left the country almost a year ago. I remember it being near embassy suites at the end of a short dead end street.